Dude! Before I became a vegan I would eat eggs at least twice per week. Boiled, scrambled, fried, deviled, in omelettes, etc. I loved eggs. While I was pregnant with my daughter the smell of meat made me sick to my stomach, but I was eating eggs by the dozen. Seriously. I would eat about 4 eggs per day for a few months. Until one day I boiled my usual 3 eggs for snacks, etc. then I peeled it, looked at that rubbery white globe and went “yuck!” Then I didn’t eat eggs for about 10 years. However, I found my way back to Egg Village, but at some point you have to accept that you’re getting older and MAYBE all that fat and other stuff in eggs isn’t really what you need to be eating. But how do you go from eating something a few times per week to not eating it at all? I found an answer, a popular vegan dish called Tofu Scramble. I was able to get the familiar taste, and even the texture of scrambled eggs but without the cholesterol and saturated fat of eggs with this delicious vegan breakfast. It’s also low on the glycemic index, and rich in antioxidants, protein, fiber, calcium and flavonols. The best part is you can get this hot and tasty breakfast on the table in just about 15 minutes. 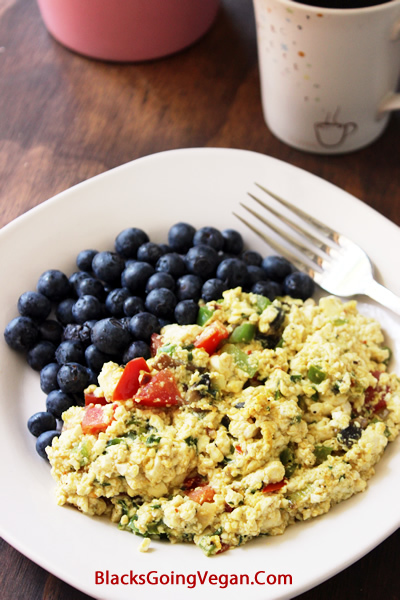 Tofu scrambles are also great for dinner or lunch. Missing eggs for breakfast? 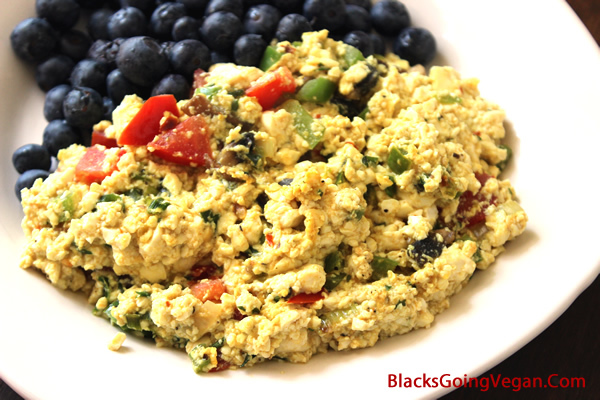 You don't have to with this fabulously easy to make and tasty tofu scramble that tastes and looks like the scrambled eggs you're so used to. Saute onion and pepper in vegan butter for about 1 minute (use a non-stick pan for best results). Break up tofu into large crumbles with your hands into a bowl and add to onion mixture, sauteing an additional 5 minutes until vegetables are tender. Stir often to mix flavors. Add remaiing ingredients, then reduce heat to medium and allow to cook 5-7 minutes more. Add more oil if needed (but using a non-stick pan can cut fat in half and reduce calories). Serve hot with hash browns, fruit, toast or grits. To reproduce the smell of eggs, use Kala Namak (black salt) vs. regular tables salt. Black salt has a sulfury smell and really makes the tofu taste like scrambled eggs. You can find it at Indian (Asian) grocers and most health food stores.